VERITAS is a first. A revolutionary new category of acoustic strings. 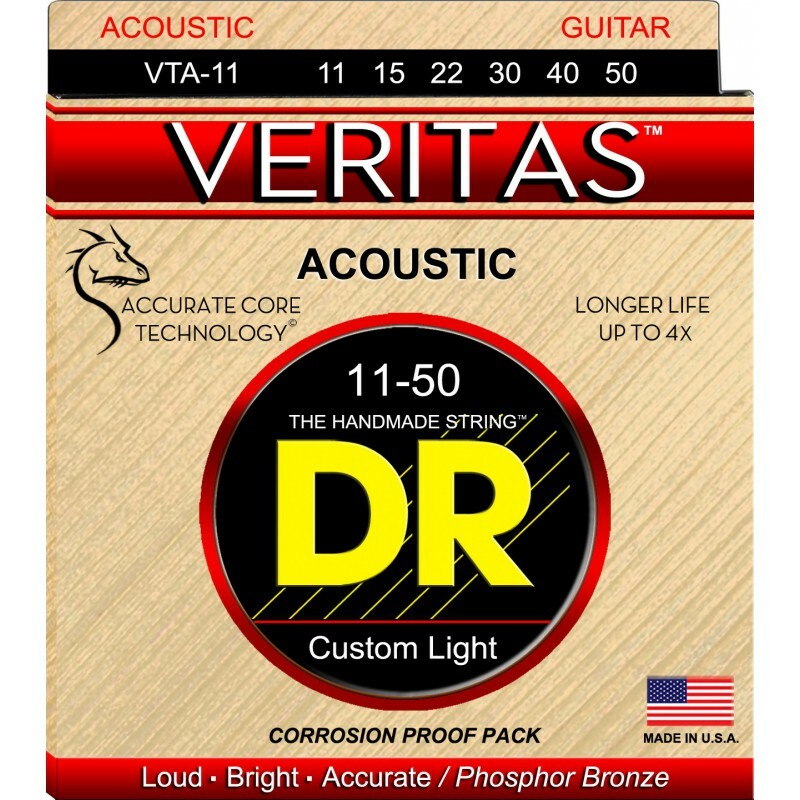 VERITAS strings last up to 4 times as long as ordinary acoustic strings. "I can play 4 or more concerts with one set of VERITAS. I used to play one concert with other strings," Stefan Grossman. "Love the way they sound," Happy Traum. Accurate Core Technology (ACT) is at the heart of VERITAS strings. Superior core wire is the foundation for tone, accuracy, and durability. DR's patented Accurate Core Technology strengthens the core wire and perfects any variations of the core wire. The core wire is far stronger and more accurate along its entire length for highly improved pitch and longer life. -Lasts up to 4 times longer -Loud and bright, notes seem to jump off the pick -Extremely stable, stays in tune surprisingly well -Robust and resonant tome, excellent sustain "Should be named Pitch Perfect," B. Richard "Amazed these strings last so long and are not coated," Happy Traum In 2010, DR introduced Accurate Core Technology in DDT...that hold tune in, and at, any tuning... Especially noticeable when players drop tune, or alternate tune. Long lasting VERITAS strings have been played by Stefan Grossman for over 3 years. This time tested technology is now at the heart of VERITAS acoustic strings.